Acoustic guitars simply can’t be beaten. Take them anywhere, indoors or outside, sit down and play. You don’t need an amp or cables, they don’t weight much, they are instantly fun and rewarding to play...it’s no wonder the acoustic guitar is one of the world’s most popular instruments. Visitors to our website or guitarguitar stores will know that there are a LOT of acoustic guitars out there. Every brand has a selection and there are innumerable colours, sizes and prices to choose from. If you are new to all of this, how are you supposed to know what to go for? Just go into a guitarguitar store and pick one that looks nice? Well, we suppose you could, and it does work for some people but why not just take five minutes, sit yourself down and read this blog? It has been written especially for YOU: you, the budding guitarist-in-training, the Padawan Rock Star. We are here today to help you make more sense of the vast and competitive world of entry-level (and not-so-entry-level) acoustic guitars. We’ve sifted through this most aggressive of market areas to bring you a selection of the best beginner’s acoustic guitars around. We’ve mainly gone for full-sized acoustics (with a notable exception) since the subject of half size and three-quarter size guitars is probably its own article! For similar reasons we have also leaned more on steel strung guitars here: check out our blog on steel vs nylon if you are unsure. All of our choices today represent an excellent option for getting started in playing guitar. All are, as of time of writing, in stock and available from us both in-store and online! Christmas time us of course upon us and stock moves very quickly so please do not delay once you’ve made your decision! Right, with that said: on to the guitars! First up, we are going to suggest two models by Adam Black: the Dreadnought-shaped S2 and the Folk-shaped O2. Both of these guitars are available in a range of finishes that includes Natural, Black and Sunburst. The S2 Dreadnought is larger and, correspondingly, has a bigger sound. Dreadnoughts are what most people think of as a typical acoustic guitar: it has a large, relatively square shape and is good for strumming chords and playing single notes. Songwriters like Dreadnoughts because they have a big, percussive sound (when strummed) that really fills up a room. These Adam Black S2 dreadnoughts are fantastic value for money at only £99 and are a comfortable, pleasurable instrument to play. The Adam Black O2 model is the equivalent model but has a smaller, shapelier Folk-sized body. Sonically, the O2 suits fingerpicking better since it has less bottom end to its sound. The volume is still there though! We’d recommend the O2 body for slightly smaller people or anyone who wants a more close-in feel. Next up is a best-selling model from Yamaha. 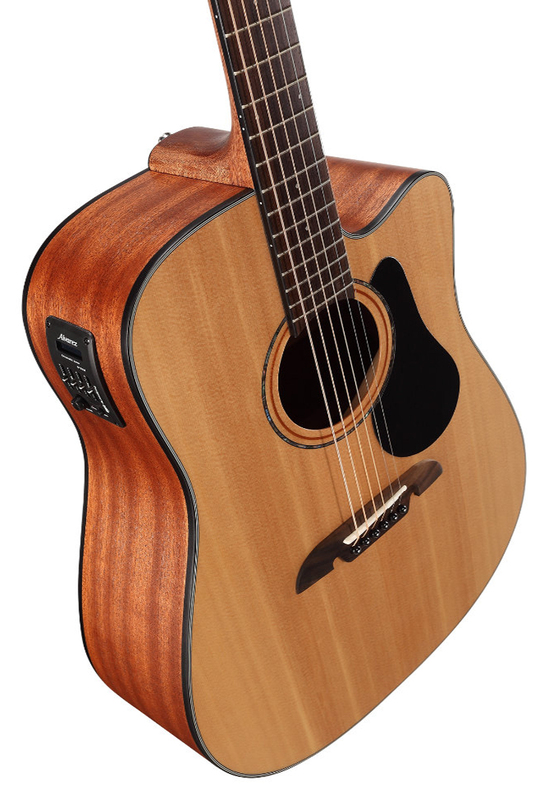 The F310 is their entry level Dreadnought model and has proven itself to be one the best-selling acoustic guitars ever. 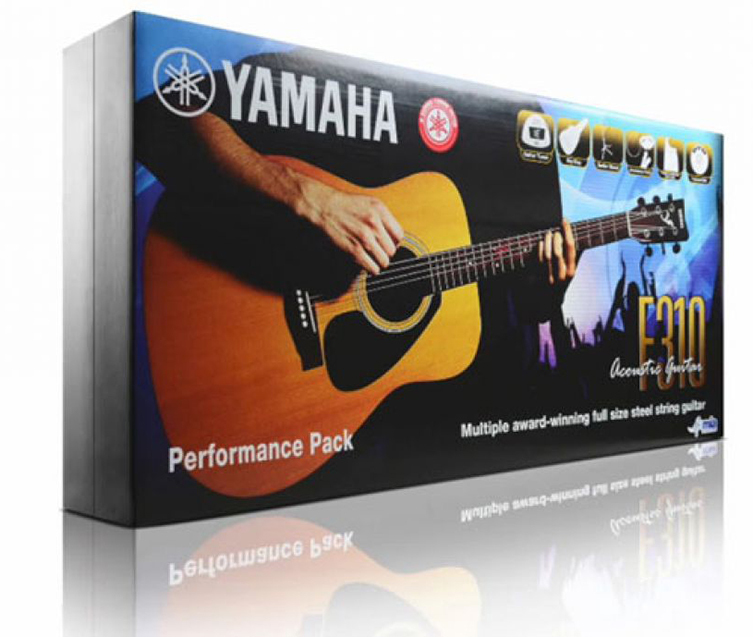 Comfortable, easy to play and well put together, the Yamaha F310 is a great buy. This F310 pack makes it even more of a sound choice: the boxed pack includes a plethora of extras like a soft gig bag, a stand, strap, tuner, strings and a DVD of tuition! What more could you need? Patience and dedication, but we can’t sell you those things so let’s keep going! Onwards! Alvarez provide some excellent quality models for guitarists looking to take their songs on to a stage at some point in the future. Alvarez make a huge range of guitars but the two we’d like to highlight today are the AD30CE and the AF30CE. Like the previous Adam Black models we looked at, these Alvarez models are a Dreadnought and a Folk shape respectively. Unlike those other guitars, however, these have built in pickup systems to allow them to be plugged directly into an amplifier or PA system! Plugged-in acoustic guitars still sound like acoustic guitars, please bear that in mind! The idea is to preserve as much of the natural acoustic tone as possible, so not distortion sounds are wanted with electro-acoustics. Clean and clear is the game and these two Alvarez models provide plenty of that! These beautiful Alvarez guitars also have ‘cutaways’ in their bodies. A cutaway is a section that is removed from the lower ‘shoulder’ of the guitar to allow your fretting hand to more easily reach the higher frets. This is a standard move that most guitar manufacturers make to discern between acoustic and ‘electro-acoustic’ guitar models (like these Alvarez guitars) though it is by no means a rule! Naturally, the technology on board these instruments puts the price up but part of that is that they are also made with what we call ‘solid tops’, which is great news. A solid top guitar uses solid timber for the instrument’s soundboard (the face of the guitar, if you will) instead of plywood. Plywood is actually fine for playing with and sounds perfectly good, but what it will not do is improve over time. 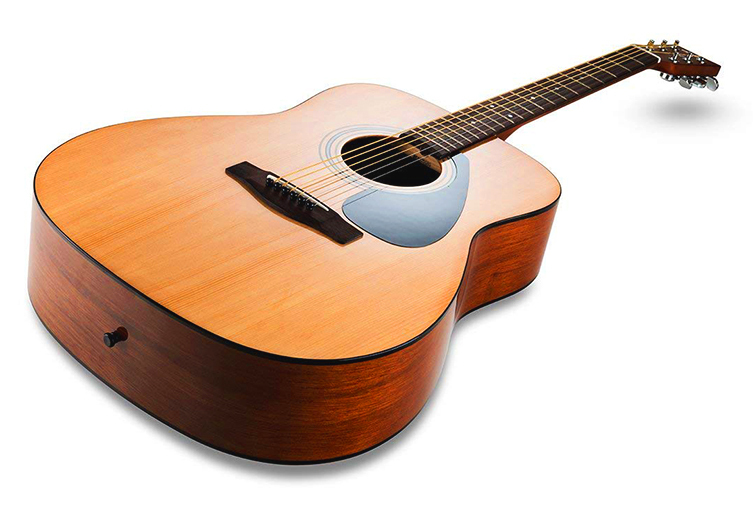 A solid-topped acoustic guitar will resonate more as it is played, breaking in over time and ‘ageing’ the sound. This is a huge tonal benefit! These Alvarez models are a steal considering what you get. Another fantastic choice from Adam Black is the O-2T Traveller. This gorgeous looking specimen is, as the name suggests, travel-sized. The body is smaller, and the neck has a scale length (distance from the headstock to the 12th fret) of 23.5 inches, which is a full inch or two less than the traditional measurements of 24.75 and 25.5 inches. Basically, smaller people will love learning on these whilst larger (or more experienced) players will love this for its highly portable size. It’s the perfect ‘in-between’ size that everyone can get on with, and at only £129 including a custom gig bag, it’s a very attractive offer indeed! Taking a brief detour from the world of steel string guitars, we’d like to introduce you to another perennially popular instrument from Yamaha’s superlative range of nylon string guitars. The C40 is an excellent guitar in any context and a superb one when you factor in the stupendous £118 price! Nylon string guitars have larger, thicker necks but softer strings that hurt the fingers less so it’s evens and odds as to whether it’s easier to play per se. The Yamaha C40, though, is a pleasure to play and has a rich, mature sound that will have you dreaming of the Spanish countryside. Nylon strings are a completely different sound and feel from steel string guitars so maybe try one of each to determine your preference. Pay us a visit and we’ll be happy to help! 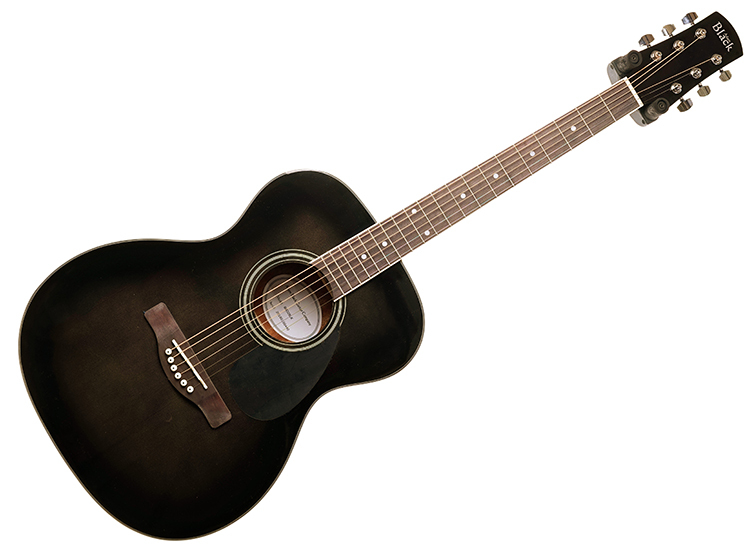 Finally, going back to steel string guitars, we have included a fantastic Jumbo-sized electro-acoustic from Epiphone. 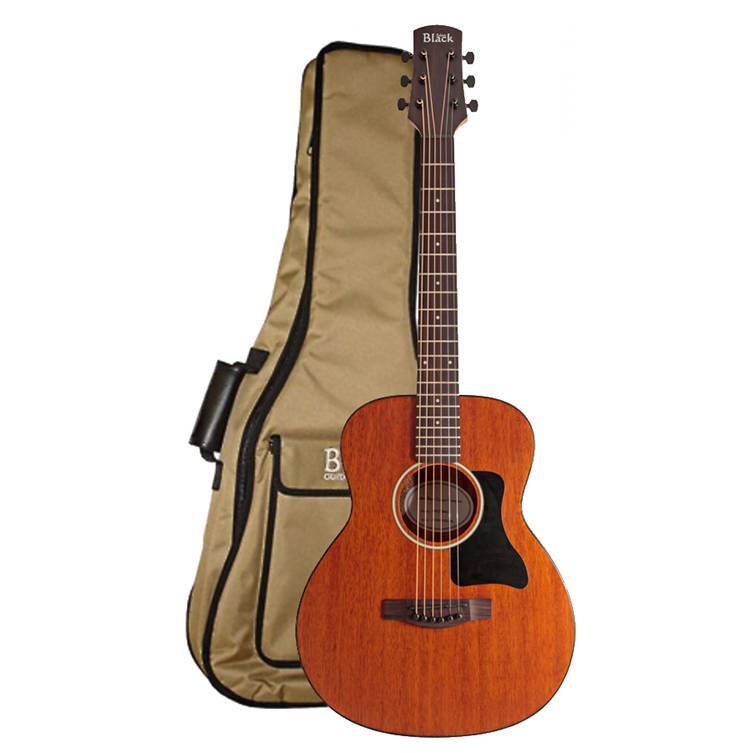 This is not a beginner’s guitar but rather an elegant, versatile classic that happens to be available at a great price. 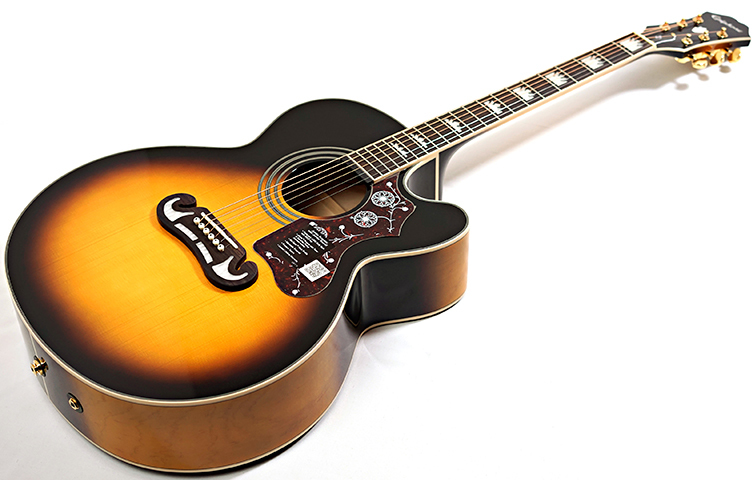 The EJ-200SCE is Epiphone’s affordable take on the legendary Gibson SJ-200. Epiphone are owned by Gibson so this version is considered ‘official’ for sure. All of the charismatic decoration has been brought through to the Epiphone model and it is undoubtedly its ‘best self’ in the Vintage Sunburst finish. 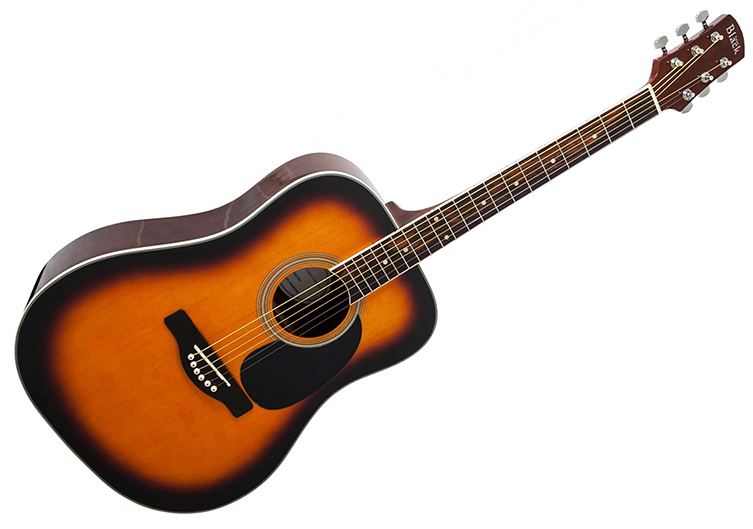 The EJ-200SCE has a solid Spruce top for quality tones that will improve with age. The large body may be trouble for smaller players but for those who can handle the additional size, the sonic rewards will most certainly compensate! A built-in pickup system (like on the Alvarez guitars) makes this an instrument that is gig-ready! Whether you are quite ready yourself is another matter but at least you know you will look and sound great when the time comes with this fantastic Epiphone. 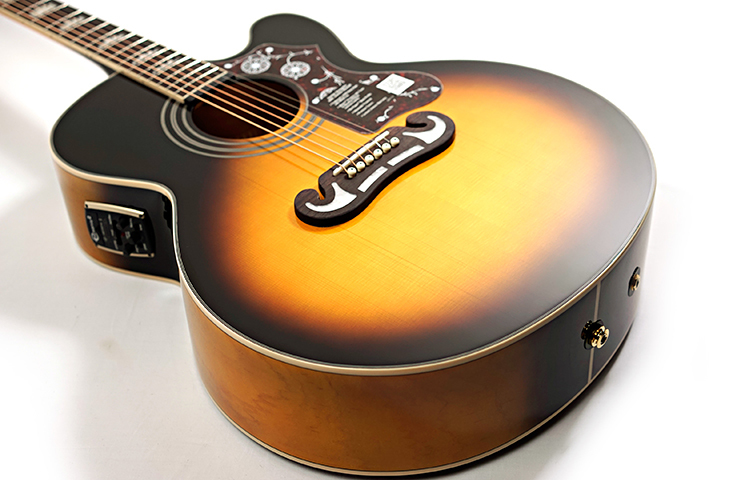 That brings us to the end of our curated list of acoustic guitars for beginners. We have hopefully illuminated some of the more confusing areas of this most wide and detailed of subjects. Everything on these lists is perfect for the needs of any beginner and far beyond, too! We invite you to try them yourself in any of our stores. We have private soundproof booths if you are shy about your talents and we have knowledgeable and friendly staff on hand ready to help guide you to your first acoustic guitar. Fare thee well and have a very Merry Christmas!